-- a new "temps.a" field is added, contains "l" (low alarm limit) "h" (high alarm limit) "r" (ringing indicator, L or H). The limits are negative if the alarm is disabled. I can't wait to get mine pieced together now! I first want to say this app is great and appreciate all the hard work. 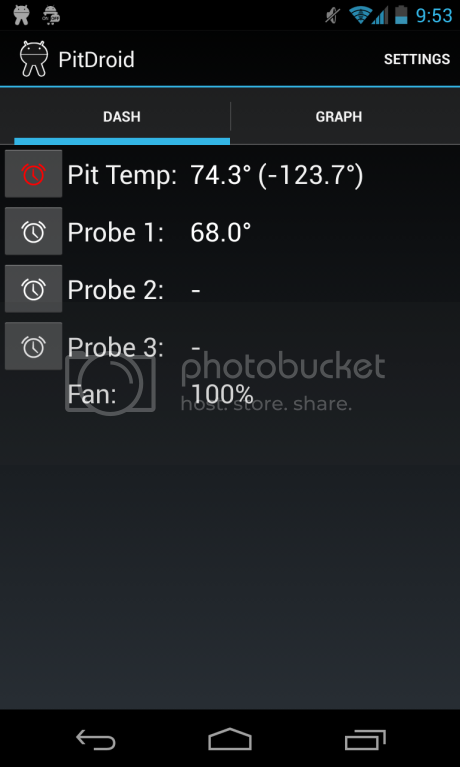 I updated the heatmeter and now the app does pull in the data. Is there plans on updating the app? I started my new job this week, so I haven't had as much time to mess around with PitDroid. I will update it to the new format soon though, and I'll look into getting the alarms to sound in silent mode. I googled that the other day and apparently all you do is turn up the volume, sound your alarm, then turn it back down. Seems kind of a gross way to do that, but if it works it works! I am able to get data and graph properly with pitdroid 0.2 and LM 6. I haven't tried alarms but I am receiving data and graphing. I uploaded a new version, with better alarm sound support. I didn't bother updating the JSON format, since it doesn't affect PitDroid currently. When I put in proper admin support I'll switch it over to using the internal alarm points though, since then I'll be able to update them too. In the screenshot, what's the -123.7 number? Edit: Nevermind. I got it figured out. Variance from setpoint. Also, the alarms aren't always triggering for me. The text turns red but the alarm doesn't sound. If I rotate the screen (portrait to landscape), then it goes off. Also, not sure if there's supposed to be an alarm silence or not. Last edited by Alan Erickson; 03-09-2013 at 09:28 PM. I'm curious what the advantage a dedicated app has over a normal HTML5 interface? Because of how Android works the alarm runs in a background service. That means it's somewhat separated from the app. So, even though a probe is over or under an alarm point in the app, the service won't know about it until it does its scheduled check. To get it to work in the app I would have to write separate alarm code for that. Not a big deal, but it just hasn't been something I've prioritized right now. I'm assuming that in general you don't need "to the second" accuracy for the alarms, since smoking is a pretty slow process. The reason the alarm goes off immediately when you rotate the screen is because when you change orientation in Android it restarts your app by default. That causes it to reschedule the background service timer, which causes it to check right away and trigger. As for why you'd want a dedicated app instead of the webpage, one reason is that the web page isn't touch optimized. Your big fat finger doesn't work too well with those little buttons. Also, having a dedicated app means we can have stuff like alarms. With the web page, as soon as you switch to another app or your phone goes to sleep the page gets shut down.